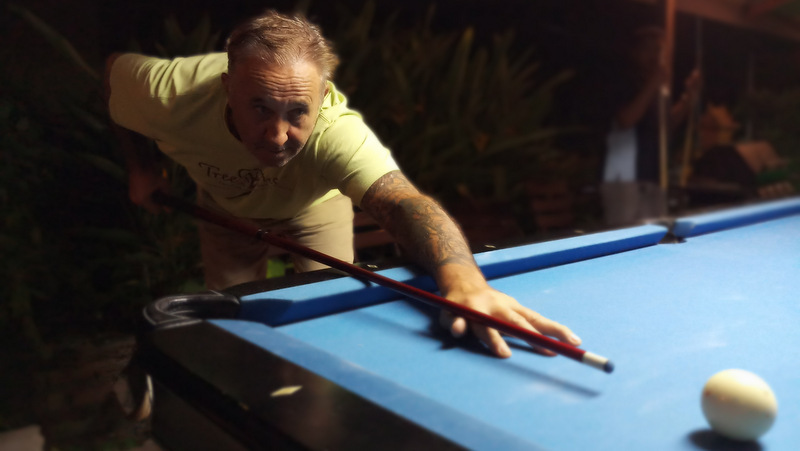 POOL: The second round of the Patong Pool League (PPL), sponsored by Thailand Pool Tables and Genius 2 Garden & Restaurant, got underway last Thursday (Nov 29). 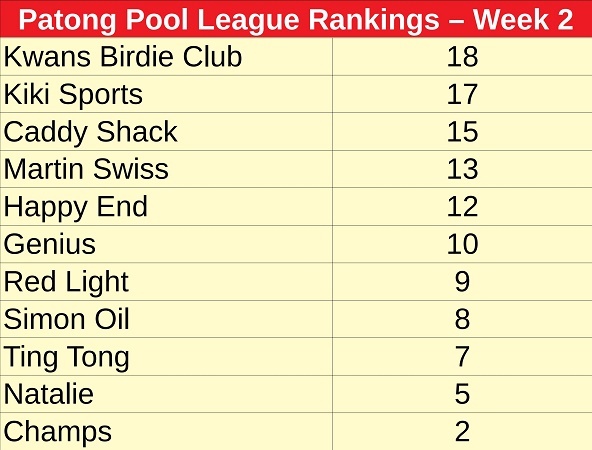 After a thrilling first week, 10 teams took to the beige and battled to take an early lead in this most competitive of leagues. Genius II were at home to Happy End and the home team made a positive start with Fern opening up the Genius account with a win over rival Ann. Peter claimed one back for the visitors and this blow for blow encounter continued to provide drama as both teams kept themselves in the match. Despite taking 2 of the 3 games in the beer leg, Happy End could not quite catch their hosts and Genius II took the match 7-5. Kiki Sports Bar looked to continue their winning streak and played away to Martin Swiss. It was the home team who took the advantage with Martin and Kid playing excellent games to secure a 2-0 lead. However, this was not to last and wins from Dr Jones, Gervais, Jack and Willem gave the advantage back to Kiki. These four players then went on to win their respective doubles games and by the time they played the beer leg the match was already won. A final score of 8-4 is another solid win for Kiki Sports Bar who are looking a difficult team to beat. Simon Oil played at home to Red Light in what was the closest encounter of the week’s play. The home team got off to a flying start and were 3-0 up thanks to Reed, Thong and Stu. However, this was short-lived and Red Light won the next 3 with Moo, Gwen and Scott replying to level the match 3-3 at the end of the singles. The doubles and beer leg played out in much the same fashion with both teams exchanging blows. A thoroughly social night was ended with them sharing the spoils at 6-6. Reigning champions Caddy Shack were on the road this week, away to title contenders Natalie. This was always going to be a tight affair and despite leading 4-2 after the singles games Natalie fought hard. Unfortunately, a perfect night from Justin and Shaun spoiled any come back from the home team and saw Caddy Shack edge the night 6-5. Kwans Birdie Club were looking to consolidate their early victory from Week 1 and got off to a flying start with Mike edging out Mick in the opening game. Keeping the trend of similar names, Jim then got the best of Jay in order to level the match 1-1. It was at this point though that Birdie found another gear and went on to take the rest of the singles and only conceded 1 game during the rest of the match. Another 9-2 win to Birdie will surely make them confident as they take pole position in the league. Champs bar had a night off this week and will join the rest of the teams in competing Week 3 of the PPL on Thursday (Dec 6).